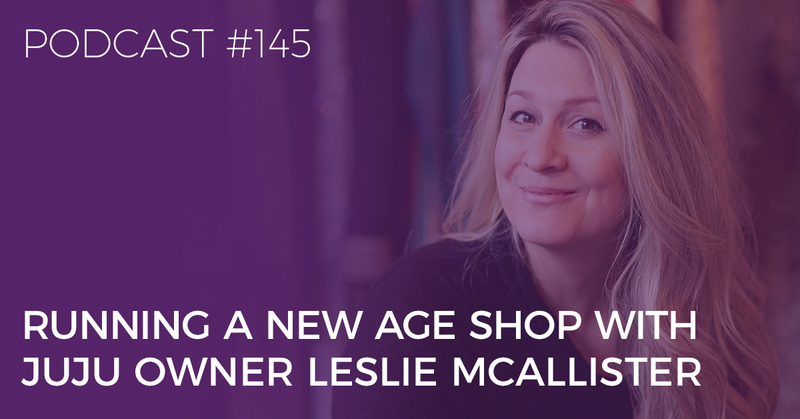 In this episode of the Biddy Tarot Podcast, you’ll hear all about Leslie McAllister’s path to opening her successful and much-loved metaphysical store Juju. Leslie also treats us to her fascinating beginnings with Tarot, which she was first exposed to by her great-grandmother. You’ll hear how she uses Tarot professionally and in her everyday life. Best of all, Leslie shares some awesome advice for people who are just starting out, and who are also going into more of a professional Tarot reading career. Brigit: You’re listening to the Biddy Tarot Podcast and this is episode 145, Tarot Today with Juju owner Leslie McAllister. 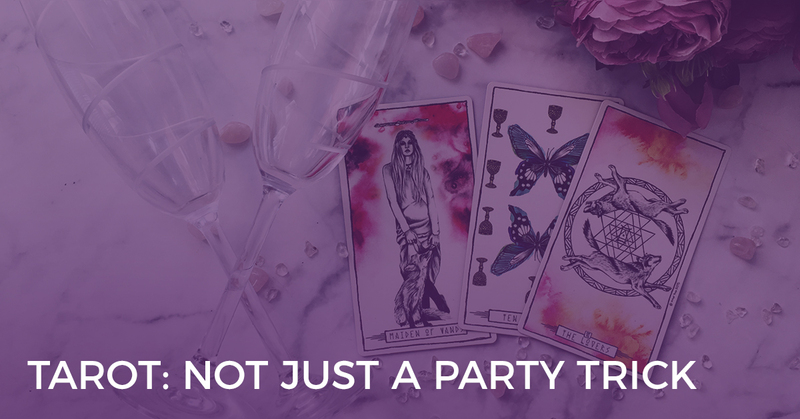 Leslie: Welcome to the Biddy Tarot Podcast where you’ll learn how to connect more deeply with your intuition and lead an empowered and enlightened life with the Tarot cards as your guide. 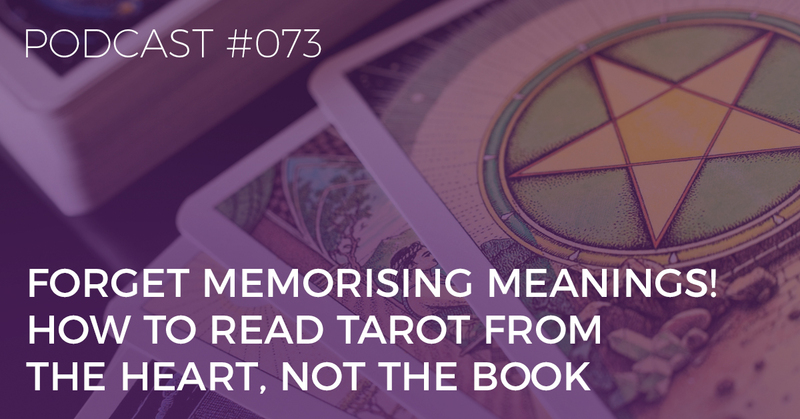 Listen as Brigit and her guests share their very best tips and strategies to help you read Tarot with confidence. And now, here’s your host, Brigit Esselmont. So that was really neat. And then what was also really neat was, well one of our team members, Laura, is also in Pennsylvania or near Pittsburgh I should say, and this is one of Laura’s favorite shops too. She loves going and getting her crystals here, and learning more about all of the different metaphysical arts and so on. And so Leslie is like, almost like a member of our little Biddy Tarot family as well. So, it’s an absolute joy to be able to meet with her, and talk with her today about Tarot, and in particular what Leslie is seeing as different Tarot trends, where Tarot’s heading, not just now but also in the future, and also how Leslie’s working with her own Tarot reading clients. 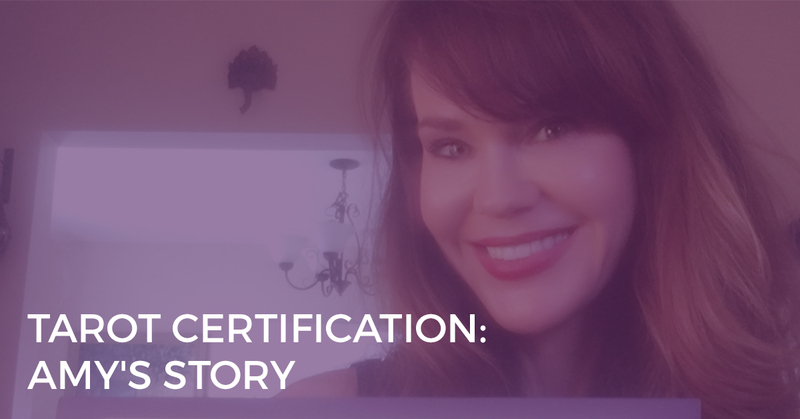 She shares some awesome advice for people who are just starting out, and who are also going into more of a professional Tarot reading career. And lots more good vibes, and also good Juju. So let’s get straight into the interview, and here we go, here’s Leslie. Well hello, Leslie, it is so exciting to have you here on the podcast. How you going today? Leslie: Doing well, doing very well. Happy to be here. Brigit: Awesome, well we’re happy to have you. Brigit: So for those people who don’t know much about you, just tell me a little bit about your background, and particularly you know, how you’ve come to create Juju and do all this awesome stuff that you do with Juju. Leslie: Oh, okay. Well I started in music school, and I went to Berkeley College Music in Boston, and was there for a couple years. Really enjoyed it, and then wanted to go back to school for fashion merchandising. So I came back to my hometown of Erie, Pennsylvania, and I went to Mercyhurst University, where I studied fashion merchandising. And was, I’ve kind of always been drawn to the fashion industry and the artistic expression of just layering different patterns and textures of clothes, and did that, and then started running a thrift shop and was collecting vintage clothes for a long time. And started working for a big bank as an executive assistant in wealth management. They were really great to me, but my soul wasn’t where it needed to be, and so I just felt like such a need to leave there and start my own thing. And I was selling vintage clothes online, and I had this three to five-year plan of moving to Pittsburgh and opening up a brick and mortar, of what I thought would be, at the time, a vintage clothing store. But my Tarot readings were becoming more popular. I was doing more professional readings for people and it kind of became this calling that I needed to mix the two of them. And so, when we moved to Pittsburgh with my guy, I started searching for a place to open up the shop, and it took a really long time to find that. But as I was doing that, I continued to do readings, building my clientele, creating a name and a place for me in this big wonderful community that Pittsburgh has. And in 2016, March of 2016, I opened up Juju. Brigit: Yeah, awesome. And is it everything that you had ever imagined and dreamed of, or I guess, I mean there’s always like little hills along the way. Leslie: It’s bigger than I imagined. It’s been, it’s so incredibly well received, and I mean every day of my life in that shop, I drop to my knees in such gratitude because the wonderful people that come into the store, it just blows my mind. There’s so much love, and this community is so embraceable, and you know, it’s a small town but it’s a bit town, and it’s just created this little orb of love, it really has, it’s pretty cool. And so yeah, I mean Juju has absolutely exceeded my expectations, and she’s constantly growing and teaching me what the community needs, what people are reaching out towards, and what I need to bring to them. So, it’s been awesome. Brigit: Fabulous, I’m so happy to hear. So, I mean given that you’ve had, like with Juju you’ve got a lot of access to all sorts of different people. Tell me a little about some of the trends that you might be seeing, and what are people coming in with? Like what do they wanna know, what do they wanna buy? What are some of these bigger, sort of new age trends? Leslie: Absolutely, well I’d like to like speak to, oh geez there we go. I dropped my crystals on the floor. Leslie: Oh man, oh God. Brigit: We’re not taking that out of the edit, that’s for sure. Leslie: I mean, so there you go, that’s me. There we go. Brigit: That’s everyday crystals, right there. Leslie: It’s the truth. Okay, so I wanted to talk real good, before I get into the trends. There’s this thing that has been brought to my attention about Pittsburgh, which I just recently found out, golly I think it was like December or January, that back when the Mayans had predicted that the calendar was ending, which was December 21st, 2012, there was reference of a geographical point, where three rivers were converging and it’s Pittsburgh. And so, I’m still learning more about what this means, but there have been confirmations. Even the Dalai Lama confirmed that Pittsburgh is this new spiritual center. There is a woman here, Vikki Hanchin, who’s a psychotherapist, and she’s been really leading the way with this research, and she says there’s this alignment that’s happening in Pittsburgh since 2012, that’s bringing us and shifting us to this higher consciousness, and she speaks to a thousand years of peace and love aligning the universe as one. From Pittsburgh. Brigit: From Juju probably no doubt. It’s like right under your store. That’s awesome. And trends to is they’re wanting to learn, so Juju’s more often to building sort of a teacher community. Teaching classes on Tarot, on elemental magic, on crystal, using your intuition with crystals, using plant allies for protection. It’s so cool, and people want more of it. And I’m just so thankful that, and I’m not alone, I’m not the only shop in Pittsburgh. There’re a handful of us in this community that are really supportive of one another, but I can speak from my own experience that they’re interested, folks are coming in. Big businesses, you can go online and get what you need, your kind of, you know, your daily basics. But small businesses like being a reader, or selling crystals in your shop, it’s more of a one on one soul connection. And sure, people can Google, what is rose quartz, or how to read Tarot, but it’s so much cooler to walk in and be embraced by someone who’s warm and bubbly like myself, and be able to create that experience to guide them through. To talk from my experience, too. So that kind of speaks to the trends that I’ve seen. Pittsburgh’s just waking up, and I think so many, so many small cities, big cities are waking up, because I’ve got folks coming in from a lot of little rural areas around Pittsburgh. I’m just so thankful to be able to be here doing it, and have a space to share. Brigit: Yeah, I think we’re here at the right time, do you know what I mean? Like you I feel there’s a huge shift, and it’s taking on new meaning. Like, say for example, I know that like Tarot, it’s been around for hundreds of years, and I know in the 60s, it sort of had a bit of a resurgence, but I think there’s something new happening right now in these last few years, and it’s similar with other metaphysical subjects as well, like the crystals, and energy healing, and so on. It’s just, I don’t know. I don’t know what it is quite yet, but there’s something blossoming and blooming in a beautiful way, and in a way that is like fueled by acceptance, and inclusiveness as well. There’s not the whole kind of, oh you know it’s like you have to be the master of this thing, or you have to know every single thing about it. It’s more like, it’s okay to have a bit of this, a bit of that, and include that in your general lifestyle. So it’s neat, exciting stuff. Leslie: Yeah, I agree, I agree. Brigit: And we get to be kind of like the midwives of this, in a way. Leslie: It’s so true, it really is. And I’m a big believer in even after all of the years that I’ve been doing it, I still don’t consider myself an expert. I’m constantly learning, and I love to be able to share that with my folks. Because I think we’re all collectively as a team learning what we all need to learn, and come together as a community, and all of our strengths can really shine. Leslie: Yeah, yeah, I just started to teach and it’s awesome, for lack of a better word, it is awesome to be … It’s a symbiotic relationship. You’re just bounding off of each other and you’re learning from each other and, yeah so I’m thankful that’s definitely, speaking to trends is, people are sponges for this information right now, and wanna learn as much as they can. I think that’s one of the biggest trends that I’m seeing. Leslie: The need to learn. Brigit: Yeah. So tell me a little bit more about your connection with Tarot and how you use Tarot in your daily practice, or just general well being. Brigit: Yeah, what attracted you to it? Leslie: Yeah, well my great-grandmother was a reader. Not a professional reader, she read for herself. She was really interested in metaphysics, astral projection, and out-of-body, and afterlife, and she was really into numerology, and she did our astrology charts when we were kids. And she passed when I was a little kid, so I only got to know her by way of her mystery, because she was very cool. But I really felt that when she passed on, she kind of handed that energy over to me. And I began to snoop around in her room, and I’d find her Tarot journals and all of her cool books. And I asked my grandmother, her daughter, if I could have them, and so this is about 12 years old when I started to really get into understanding what Tarot was. And it’s complicated. It’s especially complicated for a 12 year old kid. So I played around with it a little bit, was really attracted to the High Priestess Card, was mostly attracted to the symbology, the illustrations, the visual sort of inspiration of each card, and I played around with them for a little while, but set them aside at one point because they were complicated. But I wanted to keep that intuition flexed and so I started reading runes around the age of 15, and did that for a while. And started to realize that how much the runes and Tarot really mirrored and complimented each other, so it gave me the courage to start reading Tarot again. So that’s kind of my thing for folks too, if you’re starting to get confused with Tarot, set it aside, pick something else up, but keep that intuition strong, keep working with it. Pendulums, an oracle deck. Start small, begin to open up that third eye, and then come back to Tarot, which is what I did. Yeah, and it just kind of, you know I think it chooses you. I do, I never, I guess I never would have thought that I would become the reader that I am today, when I was 21-22. Hoped, I hoped I would be some kind of cool chick like that, but yeah I mean, it came, it just kind of came to me one day, and I was like, “I can’t stop this, I have to keep going.” So that’s kind of my personal sort of history with it. My connection to it, I was self taught. Nobody, you know back when I was learning it, it was not a cool thing to do. It was not even really popular at all. And so my sort of care and feeding of my Tarot deck, became this real relationship that I entered into. I would sleep with my cards at night, and wrap it in beautiful vintage silk handkerchief that was my grandfather’s, and just begin to feed it that respect that it needed, and it began to answer back to me. And yeah, so I just kind of stayed with caring for it, feeding it, and my intuition grew with it. And then I felt the courage to start reading for friends, and then I felt the courage to start reading for strangers, and then I felt the courage to start making it a business. Brigit: And when you started reading for strangers, was that for payment, or was that more like free for experience? Leslie: First it was, when strangers, it was for experience. And then when I turned it into a business, then I began to use it for payment. Brigit: Yeah, yeah. I’m just curious, so now that you have it more as a professional thing, do you still have the same passion for it, or has it changed? Leslie: Oh my God, oh my God, no. I, even today, I was almost broke into tears. I’m like, “You guys just know me so well.” It’s a thing. No I still love it, because I thought, I have heard of people getting a little burned out, and I do check in with myself about that. How are you feeling about it? Are you still excited to read, and I am. Because every time I read, you know you talked about how do I use in my everyday life. I don’t read for myself every day. Which I think is rare. But I think that I did, but I don’t as much. When I was getting to learn the language, I was with the cards constantly, reading every day, looking at the images, and now I feel like my, I’m reading to heal and help other people, but it’s in the healing and helping other people that I’m getting my answers every day. It’s so cool, and that’s why I love this tool so much is it really does connect you with folks, and your people, and the relationships that I built with clients have been wonderful. I do read about four to five days on average of the week. Monday, I try to rest completely but I’m usually researching or reading books about it. But yeah, it is reading for people every day, I rarely pull a daily card. But I go in and out of phases. Like I kind of feel like I might be getting back into doing that again, but it really is more like that connection with people, and those themes. Weekly themes, it’s like one week, everybody’s having a major meltdown, I don’t know what to do with my life. The next week, it’s like, I don’t know if I should stay with my boyfriend or leave him, and then the next week, it’s like, I think I need to completely change my job. So it’s so cool to see all these different themes. I feel so special to be able to be at this vantage point, to see us as a human species, and how we’re really … and the one thing too I’m always saying to folks is, you’re not alone. If you’re feeling scared right now because you’re going through a tumultuous time, have the solace in knowing that you’re not alone in this, because I’ve seen five or six other people this week, myself included, and we’re all going through it. So I feel like I have an opportunity to kind of calm a little bit too in readings. See these faces. Brigit: Yeah so in that vein, I guess as a Tarot reader, like we all think Tarot readers interpret cards and put together a reading, but it sounds like there’s so much more going on for you when you’re reading. Leslie: Yeah, yeah. You want me to walk you through what I normally do in a reading? Leslie: So I’m not a … I don’t think I’m a traditional reader, because I am self taught, so when I sit down with the cards, I don’t do any spreads. I’ll start a consultation or a reading and I’ll explain that this is like spiritual therapy, and this is an open dialogue, and I’m a fast reader, and I’m a goal oriented reader, so my thing is, I tell them, “You paid for your time, this is about you.” You interrupt me, you ask me every single question that comes to mind. You are not going to get me off track. And I always say, “My goal for this reading is for you to leave clear, confirmed in where you’re going, and having a direction or a game plan.” And so, lot of people have, are like, “Well, Tarot is this mysterious thing,” but it’s like the best problem solver out there, in my opinion. You know? It’s like this baseline for problem solving. It is magical and mystical and really, really cool. But it also is an excellent way to kind of cut through and see what the focus really needs to be on. So I kind of give them that speil in the beginning, and then my good friend Kelly taught me to do this mind, body, spirit with folks, so I call it taking your spiritual temperature, and it just allows me to break the ice with them, and it allows them to break the ice with me. They get to understand my language, and I get to kind of understand what’s going on below the surface with them. And I’ll tell you what, with those three little cards, we can unearth so much stuff, as I’m sure you know. Leslie: But it’s really cool, and so and from there, we begin to work through problem solving techniques. This or that, here or there, where’s your block, what’s your solution? Brigit: Brilliant. And so I think you had an example of helping someone, a client choose which college she should go to. Tell me a little bit more about that. So I drew a few cards around college one, and a few cards around college two. And it brought her such clarity, because everything that I was saying about, let’s say college one was our star, or sort of like a star, not to be confused with this star, but our main runner, right? This was the one that looked like it would be more of an opportunity for her to flourish, and more of an opportunity for her to kind of settle into a community, and then also the opportunity for her to grow and get a great job afterwards. And she’s like, “You know what? That’s the one I’m leaning towards. That’s the one my dad wants me to go to, that’s the one my dad went to.” But, you know both of them created great options for her, but one of them is always gonna shine a bit more. Leslie: Yeah and there was another, go ahead I’m sorry. Brigit: I was just gonna say, I think that’s a really neat example because it sounds like you, you’re not there to make the decision for her, and what you’re able to show her was, even if you went for option A or option B, both would bring great outcomes, but there might be a leaning towards one or the other. And then that’s also confirmed by her sense, so helping to link her up to her own intuition, and help her make the choice, versus, Tarot says option A, right? What else you got? Leslie: I love that you touched on the because that’s a big theme for me in readings, and often part of the conversation is, “You already know the answers. I’m here to just lift that veil for you and confirm it.” And that’s also why I love Tarot, especially with your Tarot planner. I love the fact that it’s something you can use every day, and it strengthens your intuition. Because you’re starting to realize, I know these things. And I love that Tarot illuminates that. It absolutely illuminates, wow I really am in the right track. I knew this all along. I guess I should listen to myself more. Really trust that intuition. Leslie: Yeah I love that. Brigit: Absolutely. So I guess you’re starting to see also a lot of people getting interested in Tarot, and then also starting to take on Tarot more as a profession, or for payment. How do you feel about that, as a professional reader yourself, as a teacher, as a member of a beautiful conscious society? What are your feelings about more and more people taking on that professional Tarot reader role? Leslie: I think it’s wonderful. I think it’s awesome. The more the merrier. The more in a community, the more amplified and focused the energy, and I’m for it all. And I, you know we need each other. We absolutely need each other more than ever. You know, I was talking about how, when we think about all the doctors, when we think about all the lawyers, when we think about all the yoga instructors, we’re all needed. And one of my very favorite themes about the universe, is that there is enough for us all. There is so much abundance in this world, and there is enough for all of us, and when we’re all beginning to do the same thing, it starts to create this beautiful community, this beautiful conscious community that you’re speaking of. And just even you and I connecting right now, this is all amazing. I never would have but thankfully we’re all part of it. You’ve created a platform for us all to come together which is a beautiful thing, but yes, I think it’s a good thing. I think it’s a great thing. I think it strengthens what we’re doing, and I think it brings, why do I wanna say like a credit to it I suppose? Strengthening that need more. Leslie: And we learn from each other. Brigit: Yeah, yes. I was just thinking with, well when I was putting together my business program for Tarot readers, A Great Tarot Business Online, I had a few of my friends say to me, “Are you sure you wanna do that?” I’m like, “Why?” “Aren’t you training people to create their own businesses, and what’s that gonna do to your business?” I’m like, “I don’t care about that.” I would love to have hundreds if not thousands of people going out there, shining their light in a really positive way, and changing, like changing the perception of Tarot. Changing kind of the value that they offer in the world, so yes please, like bring more people in. I wanna train more, more people, because I think that can only have a positive impact. And here’s the other thing, particularly with something like Tarot, we all have our own little magic ways of working with the cards, right? And you know what will be the right reader for one person is not gonna be the right reader for the other, and in fact the more people that we, the more readers that we have, the more choice people have and can connect into the right person for them. So, yeah I’m with you, there’s plenty to go around, and yeah. Leslie: Oh yeah, yeah, 100%, 100%. Yeah really, and the fact of the matter is, like I said earlier, we need each other. We really need each other, and I totally agree with you. My people are out there for me, your people are out there for you. But, it just, to create this sisterhood is a really beautiful thing. So I say go for it. Brigit: Yeah I think, poor all that energy into the collaborative spirit, the abundant spirit. Brigit: And in fact, you know there’s a podcast I would love to do with you, which is really about choosing your tribe, and choosing who it is that you want to spend your time with, and this particularly feeds into it, being around people who are of the abundant mindset versus the lacking, there’s not enough, and so on. So I love communities and groups of people that see that abundance and can support each other, and hold that space for growth. Leslie: Yeah, yeah it amplifies it. Brigit: Most definitely. Awesome. So again, like as a teacher, you’ve probably come across a lot of people who are new to Tarot. What advice would you have for them as they’re starting to learn how to read Tarot, and then also take it into that professional place? Leslie: Yeah so for me, and probably for you as well, and for all of us, Tarot is a language. And so it really is about learning the language. So what, when we’re learning any kind of language, we do it as much as we can. Read for everybody, read for everyone, read for your friends, read for yourself, read for strangers. Anybody that’s gonna listen, sit them down and read for them, even if it’s just a few cards. And if you have to use that guide book, use the guide book, but the important thing to know is when to set that guide book aside, and then when to take the training wheels off, and really start to get into it, you know? And that can be scary but, you kind of intuitively know when it’s time to set the book down. And then, just begin to really sit and work with the cards. What is the story that’s being told here? What is the journey of The Fool? How do all of these cards work together, and like what intuitive cues are you getting. Brigit: Have a little snuggle. Leslie: Carry it with you, yeah. Yeah like really create that bond and that respect, but yeah, begin to read for everybody. And then start to maybe do parties for people where there are strangers, where you’re kind of getting to know strangers, because you kind of, you know when you’re reading for friends, you’re a little bit more informed. When you’re reading for a stranger, it begins a dialogue. And don’t be afraid to say to people, “The more that we discuss, the better I can give you a reading.” So yeah, like events and parties, and then you’ll feel stronger and stronger, and oh I think, never stop learning. We kind of started right off saying that, right? But also for me, I will take every advantage I can of being read by another Tarot reader, because when you’re also being read by somebody else, you’re beginning to learn. You’re learning through that whole process. You’re learning their style, you might take a little bit of their style and adapt it to your style and see what feels right for you. And I think the more that you communicate with others through Tarot, the more you’re learning, and the more it becomes a true language, and then you’re fluently speaking. And you’ll know when the time is right to kind of set off and start your own business, and start your own journey. Probably like the Fool, right? Brigit: Well yeah, you’re not really sure what’s on the other side, but you just go anyway, right? Leslie: Yeah, and sometimes I feel like it’s just, it is a push. It’s just that absolute magnetic push to just, it’s time. It’s time to begin. Brigit: Yeah. Absolutely. And I think your advice around seeing other readers and learning from those experiences is really important. Both for what you want to do and what you don’t want to do. I’ve had a number of readings and I’m like, “Okay, I’m not going to be like that.” I’m making a choice, yeah, and other times I’m like, “Whoa, he handled that really well,” you know, and then integrating that into my own practice, so yeah that’s good advice. And I guess, so what do you see is the future of Tarot over the next five, ten years? Where do you think Tarot is going from here? Leslie: Yeah, well this is exciting. I think that there is, I think we’ve come a long way with Tarot, and I think there’s a lot of longevity for Tarot as well. I think we’re just now scratching the surface, and I have to attribute a lot of that to you, and to also some of these amazing indie artists that are creating these modern decks with a modern take. There is no doubt about it, that there is a new way of looking at the deck. And I know a lot of artists have been changing some of the names, instead of judgment, it’s like awakening or rejuvenation, and I love that. You know I love this female spin on Tarot. It was originally a male created thing, so I really attribute a lot of the growth of Tarot to some of the beautiful decks that are coming out. I read with the Wild Unknown deck, but Dark Days Tarot, and Mesquite Tarot these beautiful, gentle feminine energies, and Spirit Speak is doing some beautiful things, and Holly Simple has got that really fun deck as well. So I just, I really attribute it to this community of artists that are representing a new inspired visual for us. I also think that when you think about what a fad was like yoga back in the day, look at where yoga’s gone now. I would like to see Tarot grow into lots of problem solving tools. I know that a lot of therapists are bringing it into their spaces right now, and I mean I say, it’s a beautiful way of kind of working through that kind of healing. Really I just feel like, I feel like it’s got some ways to go, I really do. I feel like I’m still gonna be reading when I’m 80-90 years old. Leslie: I just feel like it’s in my life forever, I can’t escape it. It’s chosen me and I’ve chosen it back, so. Brigit: Yes. Yeah I think Tarot will continue to become more of an integrated tool. So let’s so much, less I kind of do reading, finish reading, done. But more like you say, integrated with a therapeutic practice. Integrated with other healing practices, where a Tarot reading isn’t just those 60 minutes that you’re set in front of the cards, but there’s a whole flow of events that happen around that reading. It’s almost like a full coaching experience. And I think we will probably see the Tarot cards come into places we haven’t expected like, maybe not board rooms just yet, but getting close, like maybe start up businesses. They might start having a bit more of the Tarot cards. Yeah I think there’s huge opportunity for it to be an integrated tool, versus a standalone tool. And that was certainly my vision like with the book, with Everyday Tarot, how do we start to express Tarot through our everyday life? And our everyday decisions, or relationships, or career and so on. Because I think that’s where it’s the most magic, because it just then flows into every cell, every part of your being in beautiful ways, so it’s exciting. Leslie: Yeah, it really is, it really is. I’m humbled everyday to be doing what I do. Humbled. Brigit: Yeah, that’s lovely. And Leslie, where can people find out more about you? Leslie: Oh my goodness, well I’m on Instagram at Juju_pgh. I do have a website that I’m making prettier, starting tomorrow, and email, I can give you, I’m [email protected]. But mostly Instagram is a tool that I use a lot, so I’m really good about getting back to people very quickly, vis a vis that sort of platform, and then there will be more information on my website as I begin to grow that, and build that up. And that is shop-juju.com. Brigit: All right, we’ll make sure, we’ll post those links. Brigit: So they’re crystal clear. So they’ll be over at, let me see, biddytarot.com/145 and you can get the exact links, and I bet by the time we actually publish, because we record this well in advance. By the time we publish you’re gonna have a gorgeous website. Actually is your plan to then sell online, will you have an online shop? Leslie: Yeah, yeah I currently sell just some rare sort of ritual vintage clothing right now on the site, but I will be putting more things up there. I think I have to. Brigit: Yeah, it’s an online world. Leslie: I think we just have to move that way. Brigit: And what about your course, are you gonna be doing online courses, or mostly in person? Leslie: I haven’t thought about that yet, but it’s not out of the question. Yeah, I’m just really getting the classes together, sort of IRL right now, and I am so open and just open to the guidance of where it’s supposed to go next, so yeah I wouldn’t doubt it. I’m not technically savvy, so these are lessons that I need to begin to learn in my life, so it need to happen. Brigit: Yes, it’s well worth it. And what’s the address of your store as well? Leslie: Yeah, so Juju is in a cute, cute, cute little neighborhood called Point Breeze and I’m at 6739 Reynolds Street. Pittsburgh, PA.
Brigit: Awesome, and again we’ll make sure that address is also available in the show notes, just in case. Beautiful, it has been such a joy and pleasure to talk with you today, thank you so very much. Brigit: Because it’s my coffee and sticks in the morning face. Leslie: No, you’re bright and fresh, and you’re radiant, and you’re smiley and giggly, and it just immediately put me at ease, so thank you. So there you have it. I hope you enjoyed that conversation with Leslie and I as much as I did. So nice just tapping into someone who has so many good, positive vibes around Tarot. I’m sure you could feel Leslie’s joy throughout the interview. Now, I wanna let you know that this episode of the Biddy Tarot Podcast has been brought to you by my book, Everyday Tarot. So, Everyday Tarot is a practical guide filled with actionable tips, soulful activities, and loads of Tarot spreads, to help you access your intuition, and manifest your goals and dreams in your everyday life. You’ll discover how to use the Tarot to manifest your wildest dreams, create love fueled relationships, set and achieve your goals, fulfill your sole purpose in work and life. Make important decisions, and bring the divine into your life through everyday rituals. Now Everyday Tarot is available right now for purchase. You can go to everydaytarot.com and choose your favorite book store, or you could also go into Leslie’s store like Juju or any of your favorite book stores that sell really awesome books and you’ll find it in there, and if you don’t you ask them why, and you ask them to stock it immediately. Now when you buy Everyday Tarot, you’ll also get access to the free Everyday Tarot Tool Kit, which includes even more Tarot spreads that I couldn’t fit into the book, and worksheets to help you work through the book as well. So check it all out. Go to everydaytarot.com. Awesome, well I hope you have a really good week and yeah, I look forward to talking again soon. Bye for now.